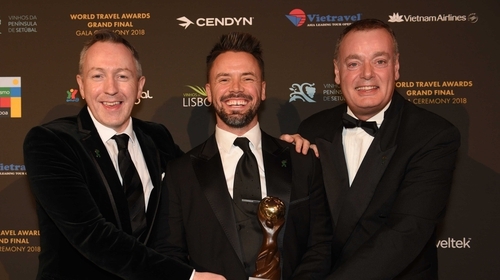 Pictured L-R Greg Hughes, John Carroll and Ray Dempsey - Jameson Distillery Bow St.
Ireland's Jameson Distillery Bow St. was named the World’s Leading Distillery Tour at the World Travel Awards Gala Ceremony in Lisbon this week. Now in its 25th year, the World Travel Awards is widely acknowledged across the globe as the ultimate travel accolade, with some referring to it as the ‘Oscars of the travel industry’. The finalist list for 'World’s Leading Distillery Tour' included Jameson, Macallan, Hennessy, Jack Daniels and Jose Cuervo. The Dublin distillery's triumph made them the only Irish winner at the awards. The win ends the year on a high for the company who were also announced as 'Europe's Leading Distillery Tour 2018' at the European Travel Awards in July. Irish Distillers embarked upon an ambitious €11M renovation project in late 2016 and since they reopened the doors to Bow St. in March 2017, it has become the most-visited whiskey experience in the world with more than 350,000 in the one year. Commenting on the accolade, Greg Hughes, Managing Director Jameson Brand Homes and Education at Irish Distillers said: "We are proud that an experience in the heart of Smithfield that champions all that is great about Ireland and Irish whiskey has been commended on the world stage. "This award is a fantastic recognition for the amazing team at Bow St. who provide each and every person that visits us with an unforgettable experience." You can see the full list of winners from the 2018 World Travel Awards here.